Glacier National Park is often called the Crown of the Continent, and for good reason: it’s one of the most stunning parks in the National Park System. With rugged mountains, alpine lakes, forests, and wildlife abound, Glacier National Park is on many people’s bucket lists. There’s beauty around every corner that effortlessly captivates her visitors. 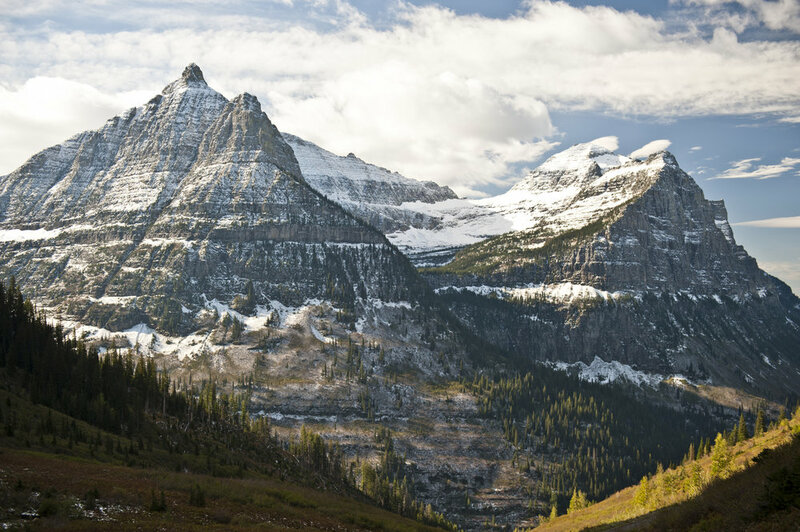 Just ask Andy–his first experience with any mountain landscape was in Glacier National Park, and his forehead was practically glued to the windshield as we drove through. Because of it’s endless beauty, Glacier National Park makes for a gorgeous elopement backdrop. Most of the National Parks allow elopements and ceremonies to take place within their boundaries, but many of them have rules/suggestions when it comes to getting married in their specific park. To elope in Glacier National Park, a special use permit must be secured first. The permit itself is $100, and the application for the permit can be found here. Glacier recommends contacting their Special Park Use office before submitting your application and fee to make sure your date is available. They can be reached at (406) 888-7832. Glacier National Park asks that the address you use on the application is a reliable place for you to receive mail because when your request is approved a Special Use Permit will be mailed to you for signature. The permit must be returned to the park within 10 business days prior to your event or the permit may be cancelled. The rangers are typically easy to get ahold of to ask questions about the permits, approved ceremony locations, approved props/decor, etc. In Glacier, there are a number of preapproved ceremony sites, and a gallery of images can be viewed here. In my personal opinion, the most stunning backdrops are Two Medicine Lake, Running Eagle Falls, Sun Point, Sprague Creek Picnic Area, Lake Josephine lakeshore, and spots along Lake McDonald. Glacier is a popular place to elope, so the earlier you’re able to turn in your permit, the better. Some people choose to forgo the permit, simply winging it or risking it, but I strongly advise applying for the permit. You certainly wouldn’t want to be fined or asked to leave on your wedding day because of a permit that wasn’t acquired. Some of the common restrictions in Glacier National Park are the types of props/decor that can be used, typically dogs aren’t allowed along the lakeshores and waterways, or in the backcountry, throwing rice/birdseed/other non-native seeds aren’t permitted, among others. The playing of instruments and amplified sound are also on the restricted list. These are in place to protect the park and it’s flora and fauna, as well as the experience of the other park guests, and these are great questions to ask a Park Ranger when you ask about your permit! Some of the ceremony locations require a bit of hiking, and a few of them are extremely popular. I suggest planning your ceremony time for either sunrise or sunset. This will give you the most flattering light of the day, with the least amount of foot traffic from other visitors. The time of year will also determine which spaces are available to you as the Going-to-the-Sun Road that crosses the park can stay closed until June due to the amount of snow they get! Glacier National Park recommends July and August as the months with the most favorable weather. Chat with your photographer about what date, time and location would make the most sense to you. When it comes to Glacier National Park, I typically suggest a sunrise/early morning ceremony so you have lots of time for traveling around the park to take photos, and then you’ll be able to enjoy the sunset afterwards. Midday gets to be quite busy, especially during the summer months, so you’ll want to plan your wedding day carefully in order to stay relaxed, flexible, and blissful. A Glacier National Park elopement is perfect for the adventurous couple that wants to exchange their vows in an unbeatable location with an incredible view. There are so many more tips and tidbits that I have for couples looking to elope in Glacier, from lodging/campground options to hike suggestions to restaurants. I would be happy to share them with you; feel free to email me directly at kate@klemstudios.com. P.S. Are you currently planning your elopement, in Glacier or otherwise? KLEM Studios has special elopement packages set up for the wanderlust, deeply in-love couples that want their wedding day photographed in an authentic, meaningful way. Click here to inquire about our options.